If you recently purchased some new speakers – or bought speakers years ago and haven't quite figured out what to do with them – we've got good news: Setting up your new audio furniture isn't nearly as hard as it used to be. In fact, it's really easy. Of course, this wasn't always the case. At one point in time, an entire industry of independent audio retailers did a brisk business of not only selling speakers, but expertly setting them up, too. Setting up sound systems can be tricky because speakers come in different shapes, sizes and configurations. You could buy a stereo setup, with or without a receiver. You might buy a subwoofer. Or you opted for a single powerful speaker or soundbar that takes up less room, yet packs a mighty punch. No matter what system you're trying to set up, though, we're glad you came to us for help. While we have plenty of ideas on how to set up a system for ourselves we've instead turned to the engineers and experts at different audio manufacturers to get a definitive guide on how to get the most out of the sound in your home. So, before you run off to cut some speaker cable, sit down for just a few minutes to learn how you can set up speakers at home by yourself and make them sound great. Now, ideally, before you bought your speakers you gave some thought to the room in which said speakers will go ... but we'll hazard a guess and say that your 7.1.2 setup might not have been at the top of your mind when setting up your living room. That's totally fine. We can work with that, but it could present a few niggles. The scientific-back benefit behind setting a room up from scratch is that, when properly set up, sound waves won't travel far or reflect off of whatever surfaces they come into contact with. The more reflective the surface, the greater the bounce. That’s why the acoustics of a room impact how music and video sound. Take a room with very heavy furnishings, upholstered couches and window treatments, for instance. They can absorb a lot of the high and mid frequency acoustic energy, thereby dulling the sound. Put too many reflective surfaces, however, and your sound could be distorted, too. We'll hazard a guess and say that your 7.1.2 setup might not have been at the top of your mind when setting up your living room. 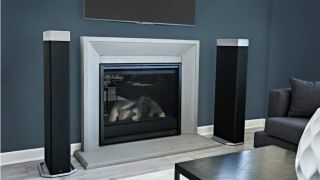 “If you were to take that exact same audio system and put it in a room with very open reflective surfaces, like hardwood floors, drywall, lots of glass, windows, minimal furnishings and little hanging on the wall, all of those reflective surfaces would make that sound way too bright,” says Lino Pucci, product manager at Bose. Of course, re-arranging the furniture in your room might not be the most realistic solution. If you're in that boat, don't worry, all hope isn't lost. In other words, your room is what it is, so you do your best to find a balance or, better yet, look to companies like Bose and Sonos to do it for you automatically via software like Sonos’ Trueplay or Bose’s AdaptiQ software. This next-gen audio software can calibrate audio to the way sound reflects in a room, taking into account your current setup. Google does something similar with its Home Max smart speaker, negating any manual setup. Others, like Yamaha and Anthem, have done the same in one way or another. If you're worried about how a system will sound in your space, consider picking up one of those systems to allay your fears of non-calibrated audio. The key takeaway here? Bigger isn't always better. In fact, Digital signal processing (DSP) has become a popular way for manufacturers to almost defy physics and manipulate sound. For example, in an ideal stereo setup, the left and right channel speakers would be symmetrically placed. When used in a single speaker, signal processing can make it sound like the left and right channels are placed further apart, even though they’re coming from one enclosure. Smaller spaces benefit from that because sound doesn’t have to travel as far, and reflects back much faster. Signal processing isn’t as relevant in multi-channel setups, but it’s still present, given the calibration involved when placing your speakers. To some degree, manufacturers do differ on whether corners are off-limits or not. Kerr from Bowers & Wilkins, says it’s a “definite no-no” to place a speaker in the corner of a room. Pucci, from Bose, agrees, but recognizes that doing so could benefit a speaker that isn’t as powerful nor connected to a subwoofer. Putting one in a corner increases the ‘boom’ effect or “boundary loading,” which boosts the bass because of the lack of spherical resonance. Basically, if the speaker is facing out from the corner, the sound just reflects off the walls right next to it. With so little distance between them, the waves all come out at once in one direction. Placing the back of the speaker a foot away from any wall is a good rule of thumb to create some distance and avoid too much boundary loading. The drivers in a speaker vibrate to ‘drive’ the air in a room. The bigger the speaker, and the bigger its drivers, the more air it can move. That’s why the tiny drivers on most desktop computers would have no chance of filling a large venue, like a concert hall, for instance. At the same time, a massive pair of speakers would move too much air in a small space, sounding sonically and physically intimidating. For that reason, placing the back of the speaker a foot away from any wall is a good rule of thumb to create some distance and avoid too much boundary loading. Stereo and surround setups are all about symmetry. The center channel is right square in the middle facing the couch. The left and right channels equidistant from one another, tilted enough to point toward the center of the couch. Both rear surround speakers essentially do the same thing, though you can choose to elevate them higher and tilt them downward. Even a 2.1 channel setup, where there are only left and right speakers, require that you position them symmetrically. Experiment with the distance from the wall. One foot is a good rule, but if you’re lacking a little bass, shortening the gap may help. That being said, if you're setting up a smart speaker or Wi-Fi-enabled device, then you also have to consider the strength of your Internet connection, too. Tip #4: Customize for music? Movies? Why not both! Bad news first: “The days of just a single purpose device in whatever room you have your TV in are fading. For example, (Bose) doesn't optimize the speaker for TV over music, or vice versa," says Pucci. Admittedly that’s putting a lot of trust in features you can’t really control, unless you have manual control over the EQ – most speakers will offer some form of adjustability, manual or otherwise, to make it sound the way you want – and while it sounds tricky to get a system that can do both, it's totally possible, just make sure to do your research. The case for a subwoofer is simply that it produces the extra bass that your speakers can’t. By lessening the strain on the speakers themselves, the sub can take over much of the low end of the spectrum and widen the soundstage. Like Pucci says, bass is usually the part of the audio spectrum the average consumer wants more of. Granted, not everyone likes the extra rumble. Kids could overdo it, neighbors in apartment or condo buildings might not appreciate a mini-earthquake in the wee hours. That marathon gaming session might cause some sleepless nights. If you have speakers that are competent and large enough to get you a good amount of bass, you're probably better off without a sub. Placing a sub closer to a wall increases the bass effect, much like it would with a speaker. Same thing if you nestle it into a corner. Those may be ideal options if you’re working with an inexpensive sub, but higher quality equipment will actually do better if you leave a foot of distance from any wall. There are a number of different options, and room layout can make a difference, so once you’ve decided you need the rumble of a sub, look for the right fit. While it's a bit of a cop out to tell you to calibrate and tweak speakers for yourself in the middle of explaining how you should setup your speakers, it's something that simply can't be avoided; 'Good' sound is subjective, and you'll need to adjust levels to get it just the way you like it. That said, if you don't trust your ears to make those kinds of decisions, you can always turn to hardware- or software-based auto-calibration to help out. A popular example of auto-calibration would be Sonos’ Trueplay. Using the Sonos app on the phone, you wave it around throughout the room, while the phone’s microphone analyzes the reflective sound it picks up to properly gauge acoustics. It works, but is proprietary to the company’s speakers. That’s the case for just about all the special auto-calibration features manufacturers offer. If there are apps that can help, regardless of what you have, then you might be in luck. In other cases, like the Google Home Max, the calibration is built-in and just works off the cuff. If you choose to go manual, you will need to bust out the tape measure and proportionally figure out placement to optimize every inch of space you have. Systems aren't always sold feature-complete. While that soundbar you just bought might offer an HDMI passthrough, it might not have features like Bluetooth, Spotify Connect, Google Cast support or AirPlay, all of which can be added in later. That’s one of the value propositions Google, Amazon and other speaker makers touch on. When you have a smart speaker with Alexa or Google Assistant built-in, you don’t have to worry about turning anything on. Of course, some upgrades can come from the manufacturers themselves via software update. These updates can help improve audio performance, or they can be physical additions. More and more manufacturers are putting out software updates to try and keep older speakers fresh. If you want to hang on to your speakers for years, consider who might help you do that. Having one room to go in to listen to music is great. But having two is even better. Thankfully there is no shortage of ways in which to expand your audio footprint throughout the house. The likes of Sonos, Denon, and many others have already gone all in on it. The idea is you can have multiple speakers in different rooms, all tied together by a Wi-Fi connection (sometimes Bluetooth) and a dedicated app. Listen to music in one room, or all of them at once. One person could listen to something in one room, while totally different music plays in the other. “You can do a Google Home type setup where you can mix and match Sony and non-Sony speakers, along with a Google Home, Mini or Max. Even if other brands introduce speakers with Google Home built-in, you'll be able to mix and match all those different speakers and use the Google Home app to set up and control them,” explains Warminiec. It’s not going to be as seamless as a dedicated multi-room platform, though. Sonos has already embraced Alexa, and Google Assistant is coming soon. Bose, Denon, Yamaha, DTS, and even others, like LG and Ultimate Ears, have all thrown in their lot with those platforms. Whether you want to do so yourself is a choice you can easily make. Audiophiles know exactly what they want to hear, whereas average listeners know when they like what they hear. Every pair of ears is different, every room is unique and every piece of technology in a modern speaker may have nuanced differences. Getting it to be perfect is challenging, clearly, as the tips in this guide demonstrate. The good news is that you have the luxury of convenience to get it as close to what you want as you can. Hard to argue with good sound when it hits you. Need some new speakers? We've got guides to the best stereo speakers, best wireless speakers, best portable Bluetooth speakers and best smart speakers!